On Knowledge Production: A Critical Reader in Contemporary Art presents a selection of newly commissioned and anthologized texts by a diverse group of artists, art historians, philosophers, and theorists who have engaged with thinking critically about the field of art as a site for the production of knowledge. The body of contributions to this reader comprise a series of critical inquires, thought experiments, documents of practice, and tentative propositions about the status of producing knowledge in contemporary art, which vary widely in perspective, approach, and form. This selection unfolds different entry points and layers, unwrapping the (often) uncritically adopted notion of “art producing knowledge” and casting diverse views on the context, meaning, and potential of this understanding of art practices today. 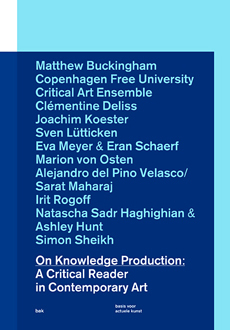 With contributions by: Matthew Buckingham, Copenhagen Free University, Critical Art Ensemble, Clémentine Deliss, Joachim Koester, Sven Lütticken, Eva Meyer & Eran Schaerf, Marion von Osten, Alejandro del Pino Velasco/Sarat Maharaj, Irit Rogoff, Natascha Sadr Haghighian & Ashley Hunt, and Simon Sheikh. This book is sadly no longer available.